â€œWe have solved a major obstacle of using anti-miRNA as a therapeutic by being able to do a targeted delivery to only inflamed endothelial cells while all other tissues examined, including liver, lung, kidney, blood cells, spleen, etc showed no detectable side-effects,â€ Jo says. Research by Joâ€™s lab, published in 2013 in Nature Communications, had established that microRNA 712 was a master controller of inflammation in atherosclerosis. In the Nature Communications paper, an antisense molecule that counteracts miRNA 712 can stop the effects of high fat diet and disturbed blood flow in the atherosclerosis model. It reaches the desired cells: endothelial cells, which line blood vessels. But the anti-miRNA has significant effects on the liver and blood cells at the same time. 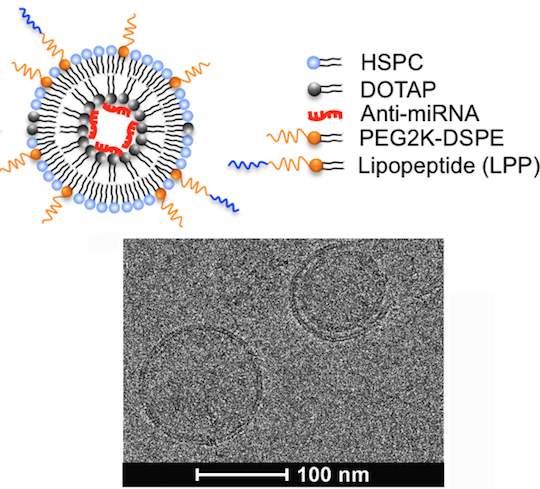 To restrict delivery of an antisense molecule countering miRNA 712 to endothelial cells, the authors built nanoparticles with several layers. Inside was the payload: the anti-miRNA, packaged with a positively charged lipid. Around that is a neutral coating, decorated with a peptide that targets the inflammatory molecule vascular cell adhesion molecule 1. The same peptide has previously been tested as a potential cardiovascular imaging tool. The resulting multi-layer package was delivered selectively to only the inflamed endothelial cells, the authors show in the ACS Nano paper. In the atherosclerosis mouse model, it was possible to use five times less than the â€œnakedâ€ untargeted version and still see beneficial effects. The multi-layer packaging method could easily be adapted to other miRNAs, such as the human equivalent miR-205, in the context of treating atherosclerosis. However,Â using other targeting peptides, with the goal of reaching other tissues, would be a bigger stretch.